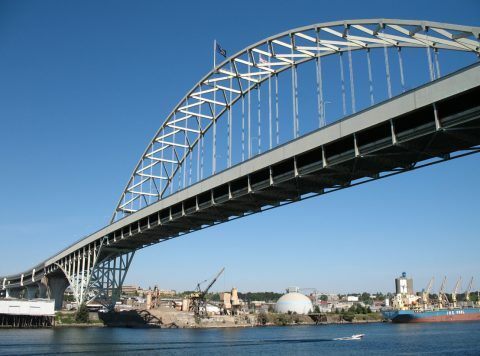 Built in 1973, the double deck Fremont Bridge carries Interstate 405 and U.S. 30 over the Willamette River north of the Pearl District in Portland. Supporting 6,000 tons on its center span, the Fremont Bridge is the longest tied arch bridge in the world.1 Photo taken 08/27/06. The Stadium Freeway, Interstate 405 is a short urban loop encircling Downtown and the Pearl District in Porland west of the Willamette River. I-405 overlaps with U.S. 30 across the Fremont Bridge to I-5 at the Boise and Eliot neighborhoods. The south end of the freeway ties into the Marquam Bridge taking Interstate 5 northeast from the South Waterfront area to East Portland. U.S. 26 westbound briefly overlaps with I-405 north from the SW 6th Avenue entrance ramp to Exit 1D for Sunset Highway west. U.S. 26 eastbound follows I-405 south from Sunset Highway to SW Broadway at Exit 1C. U.S. 26 (Sunset Highway) extends west across the Tualatin Mountains to the city of Beaverton along a freeway. 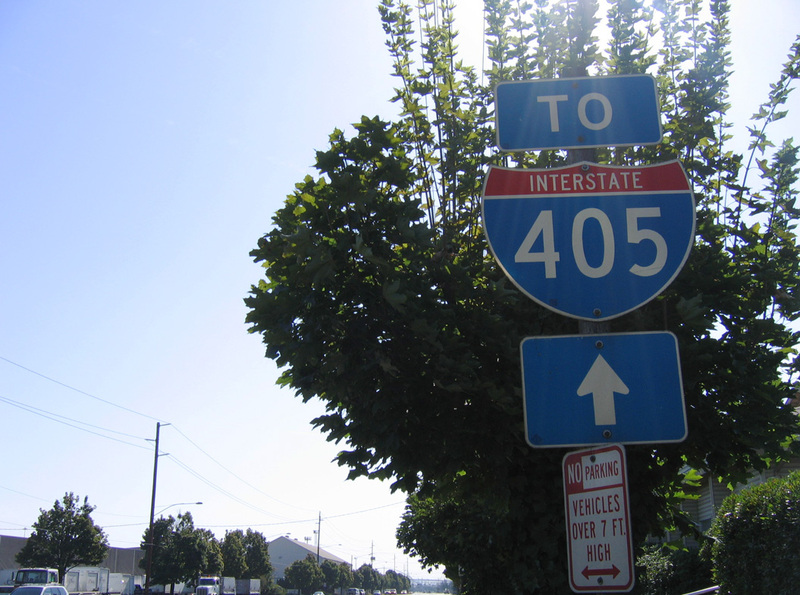 U.S. 30 combines with Interstate 405 north along the lower level of the Fremont Bridge to I-5. Photo taken 06/24/15. A left side ramp leads to Interstate 5 south to the Lloyd District where it meets I-84 (Banfield Expressway) east to The Dalles. Photo taken 06/24/15. U.S. 30 overlaps with Interstate 5 south to I-84 east to Gresham, Troutdale and through the Columbia River Gorge. Photo taken 06/24/15. Three lanes continue northbound from the Fremont Bridge to Interstate 5 north and the freeway spur to Kerby Avenue. The spur is a remnant of the cancelled Rose City Freeway through the Boise neighborhood of Portland. Photo taken 06/24/15. Interstate 405 concludes along a two lane flyover with I-5 north to the Overlook and Piedmont neighborhoods in north Portland. Photo taken 06/24/15. U.S. 30 combines with Interstate 5 north from the west end of I-84 to the Fremont Bridge with I-405 south. Photo taken 09/02/06. One quarter mile south of the full-Y interchange (Exit 302B) with Interstate 405 (Stadium Freeway) south & U.S. 30 west at the Flint Avenue overpass. U.S. 30 leads through the Northwest Industrial Area from I-405. Photo taken 09/02/06. A two lane flyover departs I-5 north for I-405 south & U.S. 30 west at Exixt 302B. St. Helens, seat of Columbia County, lines the Columbia River north of the Portland area along U.S. 30. Photo taken 09/02/06. Traveling south between the Overlook and Boise neighborhoods, one mile ahead of the separation with Interstate 405 (Stadium Freeway). Photo taken 08/27/06. An auxiliary lane opens south from the Going Street on-ramp to Exit 302B. Beaverton is a western Portland suburb along U.S. 26 (Sunset Highway). Photo taken 08/27/06. Interstate 5 angles southeast toward the Lloyd District and the Banfield Expressway (I-84). U.S. 30 west joins I-405 south over the Fremont Bridge for 0.6 miles to a three wye interchange with the Industrial Freeway spur (canceled I-505) to Yeon Avenue. Photo taken 08/27/06. Southbound I-405 reaches Exit 1C, U.S. 26 east, 6th Avenue and Ross Island Bridge just ahead of Interstate 5. Photo taken 08/27/06. 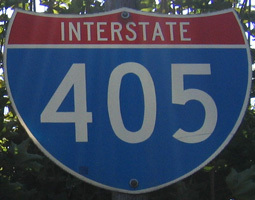 The southern extent of Interstate 405 (Stadium Freeway) remains below grade. The SW Broadway on-ramp agains the southbound roadway to four lanes ahead. Photo taken 08/27/06. Two lanes continue south from I-405 to Interstate 5 for Lake Oswego, Tualatin, Salem, Albany and Eugene. Photo taken 08/27/06. A two lane flyover links I-405 south with Interstate 5 north across the Marquam Bridge to East Portland. I-5 connects with Interstate 84 & U.S. 30 east to Gresham, Troutdale, The Dalles, and Boise, Idaho. Photo taken 08/27/06. Southbound Interstate 5 spans the Willamette River across the lower deck of the Marquam Bridge leading directly to I-405 (Stadium Freeway) north. Photo taken 08/27/06. Two lanes separate for both the continuation of Interstate 5 south toward Salem and the I-405 north to U.S. 26 (Sunset Highway) west to Beaverton. Photo taken 08/27/06. Ramp stubs at the three-wye interchange connecting the Marquam Bridge (I-5) with Interstate 405 (Stadium Freeway) remain from the unbuilt Mount Hood Freeway. The Mount Hood Freeway was planned as a high speed route for U.S. 26 east to Gresham. Photo taken 08/27/06. Interstate 5 runs along the South Waterfront adjacent to the Willamette River on the approach to Downtown Portland. Exit 299A connects with U.S. 26 and Oregon east across the Ross Island Bridge 0.4 miles ahead of the split with Interstate 405. Photo taken by Chris Elbert (03/06/04). Left Exit 299B parts ways with Interstate 5 north for I-405 (Stadium Freeway) and SW Harbor Drive north to the Portland city center. Photo taken 08/27/06. Northbound I-405 shifts onto a two lane flyover at SW Harbor Drive (Exit 1A). Harbor Drive replaced a portion of the Old Harbor Freeway. The former roadway for U.S. 99W extended north through what is now Portland’s Waterfront Park to the Steel Bridge. Photo taken 08/27/06. SW Harbor Drive connects with Harrison Street and Naito Parkway on the south side of Downtown Portland. I-405 turns west toward U.S. 26 (Sunset Highway) to Beaverton. Photo taken 08/27/06. Interstate 50th Anniversary: The Story of Oregon’s Interstates. Page updated February 28, 2019.